As the first school of communications to launch a virtual reality storytelling course tailored to journalists and television and film producers, the Newhouse School is poised to expand into the exciting new medium of augmented reality. That opportunity will come early next month, when the school will become a wave 1 tester of Microsoft HoloLens, a futuristic visor that brings 3D holograms to life within the wearer’s world. 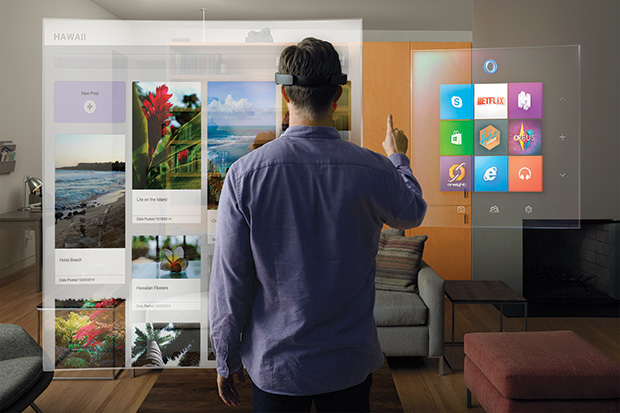 Unlike virtual reality, which tricks users’ brains into thinking they’re somewhere else, HoloLens creates the illusion that 3D objects and avatars are in the same room as the user. Pacheco had the opportunity to test HoloLens last summer, thanks to alumnus Larry Hyrb ’89, director of programming of Xbox Live. 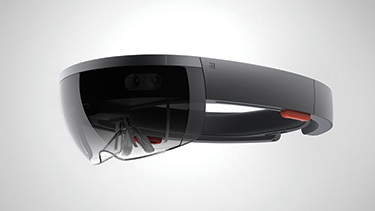 Pacheco described his HoloLens experience for MediaShift’s Idea Lab. “After virtual reality, augmented reality is the next big area of opportunity for experiential content development,” says Pacheco, who runs the virtual reality storytelling course. Pacheco was also co-producer on an Edward R. Murrow Award-winning virtual reality journalism project for Gannett. The field of augmented reality is also poised to generate a lot of revenue. Tech investment advisor Digi-Capital projects a $90 billion market by 2020, and $150 billion for augmented reality and virtual reality together. Augmented reality startup Magic Leap has already raised $1.3 billion for its yet-to-be-launched offering. HoloLens will supplement the Newhouse School’s burgeoning expertise in virtual reality storytelling. Thanks to the leadership of Newhouse Dean Lorraine Branham, the equipment space at Newhouse (affectionately known as “the Cage”) is now stocked with eight 360 video camera rigs built by Pacheco, Harper and graduate student Aron Nah. Industry leaders have also taken notice and have expressed interest in hiring Newhouse students to join their virtual reality teams. In addition to supporting student storytelling, Pacheco and Harper hope to use HoloLens to create mixed reality applications that help people at all levels of scientific knowledge understand the complexities surrounding climate change. “We will focus on narrative, data-driven stories that address the human psychology of long-term risk, and stories that evoke empathy to help people relate to complex scientific ideas,” says Pacheco. For example, a user could experience weather phenomena as realistic 3D models with audio explainers of the underlying science behind increasing storm frequency and severity, or get a first-person view of what projected sea level rise means for coastal cities. “What will it mean when every living room or office can be operated as a museum-like exploratory space? And how do you impart information in a way that hasn’t been possible before? It’s very exciting. Our students really are living in the future, and they will be the ones who answer these questions,” says Pacheco.